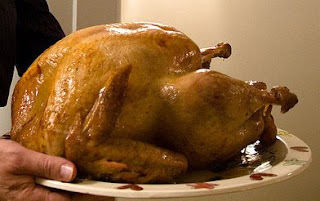 Tomorrow, the U.S. celebrates Thanksgiving Day and no celebration is complete without the legendary turkey. There is no evidence to prove that the customary turkey was part of the initial Thanksgiving feast. According to first hand account written by the leader of the colony, Gov. William Bradford sent "four men fowling" after wild ducks and geese. It is not certain that wild turkey was part of their feast. It could have been venison- flesh of a deer or wild goose meat. The term "turkey" was used by the Pilgrims to mean any sort of wild fowl. There is also a folklore about Queen Elizabeth of 16th Century England who was chewing a roasted goose during a harvest Festival. During the meal, she got to know that the Spanish Armada, which was on its way to attack England, had sunk. To celebrate the good news, she ordered a second goose. Goose, then, became a favorite bird at harvest time in England. However, when the Pilgrims arrived in America, they replaced the roasted goose with roasted turkey as the main course because turkeys are easier to find in America. Today, turkey is the main star in every household during Thanksgiving. that you see natural breasts."